130 families have completed the construction of their greenhouses. This greenhouse [photo on the right] is newly built and belongs to three families. They have just planted green papers, Chinese cabbage, carrot and onions. Everything is growing well even though it is very cold at the site currently. This is going to help these families to be able to grow fresh produce all year long. Thank you SO MUCH for your support of our 10th year in China. Saturday night, 13th October, will be remembered by us as for a long time - a night of grace, emotion, laughter, excitement, astonishment and exceeding generosity. A few days ago a boy randomly gave me a strawberry as I stood by his mountain-top village trying to catch my breath. At 3,700m altitude the air certainly gets thin. But even my mind - dulled with headache from a lack of oxygen - did not miss the significance that the strawberry was especially picked because it was in the shape of a heart. 2018 Greenhouse Construction Program - let the fun begin! 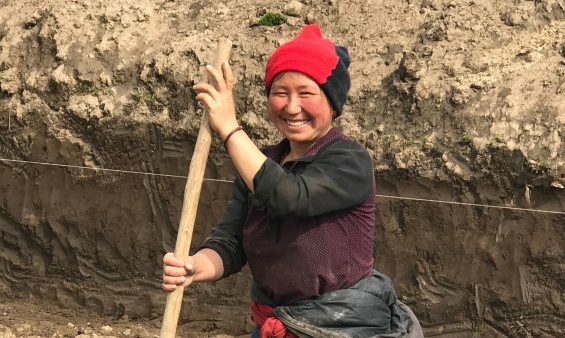 With the long Qinghai winter coming to an end, so starts the beginning of what will be a very active greenhouse construction summer for Captivating and our local charity partner, Shamtse. As we write this, 141 families (mostly single mother households) are waiting in great expectation for their Captivating greenhouse to be constructed. During the past year, 171 greenhouses were built throughout Western China. This is no easy task and so we thought we'd share with you the steps to building a greenhouse. Life in rural Qinghai is hard. And the grinding poverty is deepest for single moms who are on their own, taking care of their children and often elderly parents as well. Thanks to the ongoing and generous support of GPA Global, our 2017 aim of funding the construction of greenhouses for 200 families is well on the way. As of today, 96 families are already enjoying produce from their greenhouses (see pictures). A further 43 families will finish construction their greenhouses in a matter of weeks.